and paintings & sculpture by Indian Market winner Sheldon Harvey. We offer the work of today's top artists as well as historic works from the past. New Zuni fetishes and Cochiti fetishes posted 04/11/19! 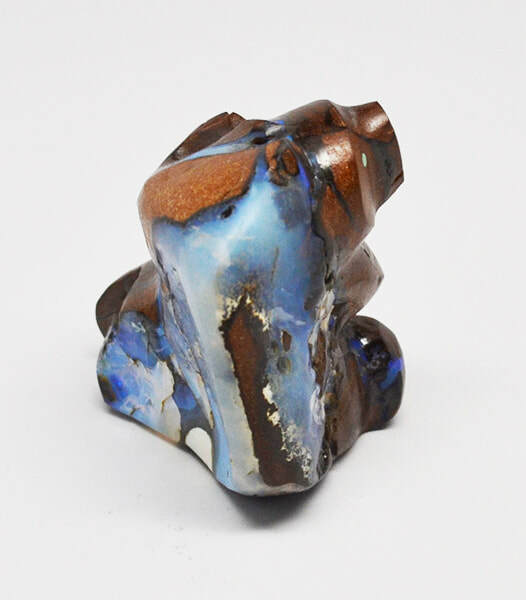 Spectacular boulder opal sitting bear by Dee Edaakie, Zuni. Grey Dog after hours, December. Our signs are up! There is plenty of parking in the Albuquerque Museum parking lot, with easy access to our gallery through the "Welcome to Old Town" arch. The gallery is open, and we anticipate the museum will open early fall. Click the Zuni Fetish Museum link at left to follow our progress! Sign up for the Grey Dog Trading newsletter! Subscribers are able to see previews of new Zuni fetishes and other Native American art before it is offered to the general public. ​We value your privacy and will never sell, trade, or give out customer information unless required by law. Gallery is open Monday-Saturday 10 to 5:00. Visit us in beautiful Old Town Albuquerque! We're on Facebook! If you like us, please like our page!